Born in 1940 in Brooklyn, NY, Judge Bechefsky was a "stellar" criminal defense attorney, respected judge, committed bar member and devoted father. 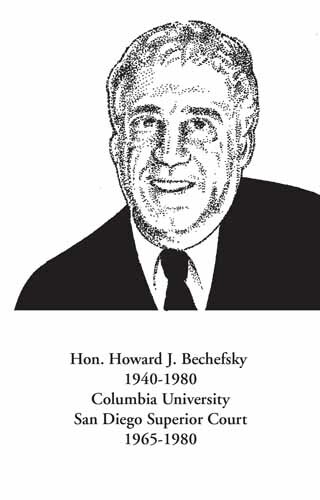 After high school Judge Bechefsky was offered two engineering scholarships but chose instead to go on to Columbia University where he earned his bachelor's degree in 1962, and his law degree in 1965. Without the scholarship to sustain him, judge Bechefsky worked various jobs including selling hot dogs and working as a soda "jerk." After law school he served as a Deputy Attorney General in Los Angeles before joining Sheela, Lightner, Hughes, Castro & Walsh in San Diego. In 1977 then-Gov. Brown appointed him as a judge to the Municipal Court in El Cajon, where he served for a year before then-Gov. Brown appointed him to the San Diego Superior Court. Judge Bechefsky remained on the bench until his death. A memorable family moment occurred when Judge Bechefsky,s father came from Brooklyn for the swearing-in ceremony. Having never gotten past the fourth grade, Mr. Bechefsky was extremely proud of his son. Judge Bechefsky served on the Board of Directors of the San Diego County Bar Association as a Director and President. He was President of Defenders, Inc., and a member of the California Judges Association. Judge Bechefsky served on the Board of Directors of the San Diego County Bar Foundation and chaired its first Grants Review Committee. Judge Bechefsky was known for his charisma, generosity, sense of humor, commitment to family, and love of sports. He was an avid runner and also enjoyed swimming. When his sister joined him at a Children's Hospital meeting, he introduced himself as "Howie Bechefsky, Claire's little brother." He was survived by his wife, Rachel, daughter, Helen; son, Michael; and sister, Claire.